The Matai system of Samoan local government is a traditional one sitting uncomfortably underneath the new Western-style government with three branches, the Judiciary (the judges), the Executive (Head of State,Prime Minister & Co) and the Legislative Assembly (Parliament). While complementary in many ways (the central government manages national affairs and the Matais are almost totally village-based1) these two sectors of power and control definitely compete as well. Tension as well as cooperation exists between them. The Matai system is closer to the biblical ideal2 than that of democracy, a form of government that contrary to Winston Churchill’s3 mischievous quip that it is “the worst form of government bar all the rest”, is actually totally condemned in scripture4. That said though, while the Matai system itself is inherently sound (or certainly was until the Westernisation of Samoa), the application contains much corruption. As always it is ‘power and money’ that feature in the corruption. Countless are the villages I have engaged with where the people refer to their leaders as greedy and unworthy of assistance. As with all of Samoa, self-interest abounds in the halls of local government power. 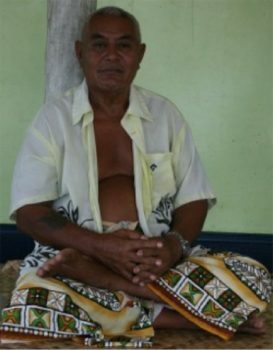 Briefly, a Matai is a chief ‘title’ similar in some ways to a ‘Sir’ or a ‘Lord’, appointed by a family, extended family and village to rule. Consensus decision-making is the theory but politics and fighting are the norm. While there have been some high profile conflicts that have festered, in some cases for years and even generations, Samoa as a rule does tend to accept the decisions of their appointed leaders and move on with life. This is a cultural respect for authority that the West can and should learn from. Dealing with the greed and self-interest however is something that Samoa needs to learn about. What is normal in Samoa however is not necessarily good or right. A young man we engaged with wanted to build a house on family land for the purposes of hosting village stays – a joint venture the SWAP Foundation conducts with families in many different villages. Normally the Matai of the family would simply approve his access to land and the boy would proceed to build and develop the land. The problem arose however when the matriarch of the family realised that there was a business involved in the plans and a Palagi at that! Her advice was to avoid doing anything in her own village because she knew the High Chief of the village all too well. She knew that he would be stepping in to take a percentage of any proceeds, probably a large percentage too. She also knew that all the Matais of the village would wait until the boy had built his house and then they would be in a strong position to leverage benefit for themselves. We took the matriarch’s advice and went to an uncle in a neighbouring village attempting to escape from unrealistic expectations. Yet again the Matai, the boy’s uncle saw that there was a Palagi business behind the idea, and instead of simply letting the boy use the land (as is normal) the uncle attempted to charge him $500.00 per month! Such is the true nature of the Samoan Matai in practice at a local leadership level. I was in a village in Savaii recently discussing the recent punishment of a boy and his family for a wrongdoing. The punishment was a several thousand dollar fine, payable to the Matais of course. The money was paid as required (begged and borrowed from overseas family, for the family was subsistence farming and had nothing); the entire village leadership was drunk within 24 hours. Again while negative comment about this sort of thing is made on occasion, this conduct is perfectly normal here, and the corruption continues unabated. I received a call a while back from a friend who sought financial assistance from me. I offered what I had, some $50.00 but he needed a hundred times that . . . his brother had gotten the Pastor’s daughter pregnant and the village had fined his family $5,000.00, which they had to find before the end of the week or face eviction from the village. This time the Matais voted a portion of the windfall to the Pastor (which stopped him from following through on his threat to leave the village, and thus shame them, the village), a portion was allocated to the village water project, and another portion to themselves. Samoans are a proud, even stiff-necked people who are experts at gaining and using authority over others. When conflict arises things can get ugly. In an example of a power-play between the Western-style rules and the Matai system of local government in a well-publicised conflict a Village Council instructed the boys to burn down one families house, kill their animals and evict them from the village. Losses were extremely high and the aggrieved family took the Matais to court, and won their case. Judgement was entered against the Matais who originally instructed the destruction but only partial payments have occurred. The shame on the Matais for having their wings clipped by a Western-style court system is huge and equals their contempt of court. I can’t pass judgement on the conduct of the Matais in this case but a court already has, and it is clear that injustice occurred and this is the nature of corruption at a local government level, greed, egos, power-plays and much ugly stuff as Matais square-off and fight for their and their families best interests as they see it. Another area of conflict is the role of the Pulinuu, the village mayor. Funded monthly from central government, the Pulinuu have a key role in several village operations, particularly around the time of the central government elections. During the 2011 elections I was involved with a friend who ran for parliament. He failed to secure the seat and sought to establish why he failed when on the surface one would have thought that he should have won. Finding irregularities (the incumbent, a powerful man had ‘rung in’ voters from all around the island) my friend approached the Pulinuu to find out what had really happened. The Pulinuu apparently went ‘white’ at having been found out to have ‘cooked the books’ in favour of the man with power and money. Such is Samoan politics and as far as I have seen with my own eyes, corruption is very much alive and well at a local government level despite protestations to the contrary from those with a vested interest in presenting otherwise. Now as always there are also examples of graciousness, forgiveness and charity within the Matai system, as there are people less inclined to look after self, but from my experiences corruption is very much alive and well in Samoan local politics and the ‘good guys’ here are the exception. The New Zealand Left … is a wild, anarchic melange of individuals & groups, united only by the fierce conviction that all those who challenge the phantasmagoria of sectional sensitivities which constitute the contemporary “progressive” movement must ipso facto be fascists whose every public utterance, being “hate speech”, must be suppressed – by any means necessary.